It is often referenced that the Satkona-Shatkona is the symbol of the Hindu deity known as Sanat Kumara (and by many other names). A “six-pointed star”, is two interlocking triangles; the upper stands for Shiva, purusha and fire, the lower for Shakti, prakriti and water Their union gives birth to Sanat Kumara, whose sacred number is six. 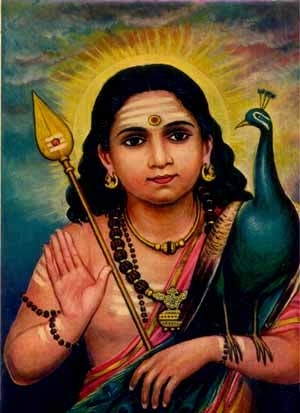 Sanat Kumara is known by many names – Skanda, Subramaniam, Murugan, Murukan, Skanda-Kumara, and Shanmukha. In Sri Lanka, there is an ancient temple of Kataragama or Katir-kamam, a shrine complex of antiquity and sanctity that attracts many thousands of Buddhist, Hindu, and even Muslim devotees. They come year round, particularly during the fortnight-long Aesala Festival in July-August. It is at this time that a small casket believed to contain the secret of the god’s birth — some say the god himself — is taken out in a solemn, yet joyful, torchlit procession nightly. It is escorted by his female-votaries and troupes of riotous dancers. The latter represent the animal, human, chthonic, and heavenly spheres. Broadly speaking, scholars, and cult-adherents alike identify him with the ever-popular Tamil hill god Murukan (“Tender One”). This god is said to have arisen before the dawn of history and has long been considered as the Dravidian counterpart or expression of the pan-Indian war god Skanda-Kumara, “son” of the great mountain-dwelling god Shiva. Of particular interest, however, is the god’s longstanding association with the number six and the shatkona yantra or “six-cornered magical diagram.” For the shatkona yantra (etched upon a metal plate) is precisely what is believed to be contained in the small casket that is taken out in procession at Kataragama. This deity has a Sanskrit name: Shanmukha (Tamil: Arumukam) means “having six faces,” is homologized to the hexagram: a figure composed of two intersecting equilateral triangles representing the mother-principle and the father-principle in balanced union. From this there is the Holy Child known to mythologies all over the world. 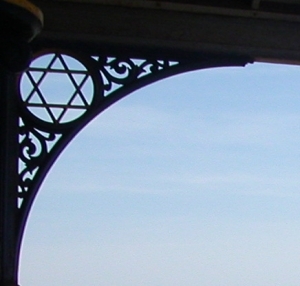 Moreover, the yantra in conjunction with the vel or spear corresponds to the archetypal warrior’s shield and spear or, in another context, to the axis mundi and the chakra (wheel) or loka (plane of existence) through which the axis mundi or “solar ray” passes as an axle around which a wheel turns. The image on the right here displays Karthikeya with spear (Vel) and sun rising behind. 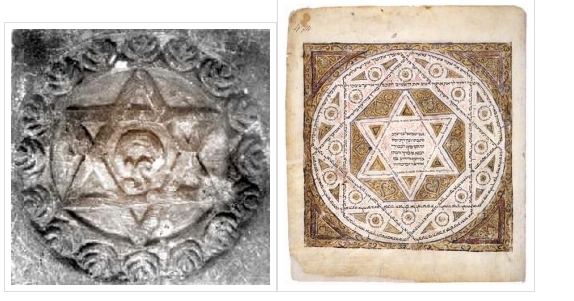 The yantra is another product of India’s indigenous, non-discursive schools of ritual magic. As such it is intended not merely for decorative purposes but for its magical efficacy. Its etymology offers a clue to the yantra’s function and reason for being. Like the similar terms mantra and tantra, it consists of a verbal root yam (“to hold”) plus the suffix -tra denoting instrumentality. Hence, ya(m)-tra or yantra, “a device that holds,” that is, a container — especially one designed to hold the representation or locus of energy of a spirit, or god (deva). This then raises the questions of the uses the Satkona-Shatkona may be put to, and the effect, the feeling and vibration that comes when we use Satkona-Shatkona in meditation. We will take this up in other articles, for preparation is important, time (when we meditate) is important, and speed – that is speed of the vibration – is very important as now is the time of advance to 4th Dimensional, 5th Dimensional reality, and time is faster, vibrations are higher (or faster, if you prefer) and energy is of a different frequency. These are matters we must look into. As the Satkona-Shatkona is also a representation of Sri Chakra, we will look to the heart chakra, where many do daily meditation. 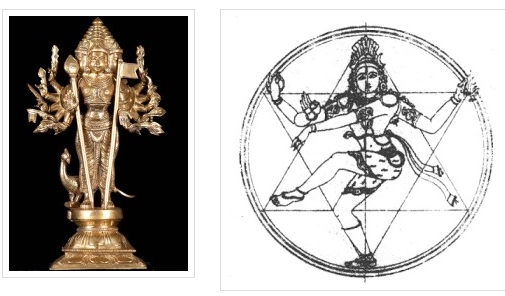 The Basics: The Shatkona is a symbol for Shiva and Shakti. It is made from two triangles (trikona in sanskrit). Shiva is represented by the upward pointing triangle (&xutri;) and Shakti by the downward pointing triangle (&xdtri;). Shiva represents the masculine side of God and the parashiva, the all pervasive mysterious form of Shiva without qualities. Shakti represents the feminine side of God and the parashakti, the power of Shiva. The upward-pointing triangle can also represent purusha (the supreme being), and the downward-pointing one Prakṛti, or the world seen as mother nature. Overlapping they remind us that all these are qualities of one God, neither male nor female but encompassing both (✡). 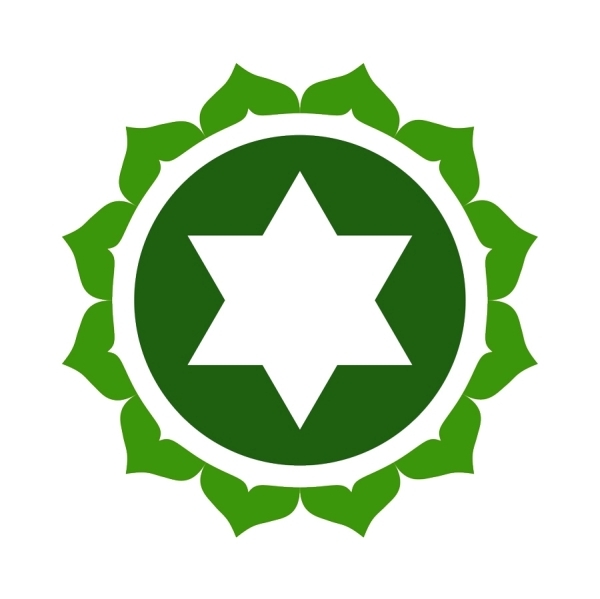 This symbol appears in the twelve-petalled Anahata chakra, or heart chakra. The Sanskrit term Anahata means ‘unstruck’, which holds much meaning and opens out to different levels of interpretation. The main one from Bihar school, emphasises that all sound in the universe is produced by two opposing forces or objects striking together to produce vibrational sound waves that are carried through the medium of Air, the element related to anahata. But the sound produced from the heart chakra is the primordial ever present sound of the universe (OM, audible in deep meditation), which is free from two opposing forces and causation. In the same way that love, the purest emotion related to and emanating from the heart is also free from causation, it just is, all pervading as air, unconditional and essential. It communicates directly to the heart of another and needs no proof and no cause.